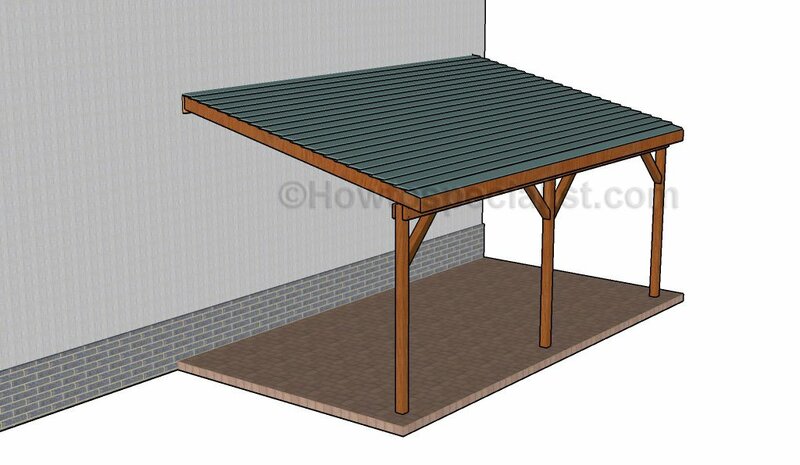 This step by step diy woodworking project is about 3 car carport roof plans. This is PART 2 of the large carport project, where I show you how to build the gable roof and install it into place. In addition, I suggest a few customization ideas so you can build the carport of your dreams. There are many storage projects featured on our site, so don’t be afraid to browse through the rest of the woodworking plans. Fit the trusses to the top of the carport and place them every 24″ on center. Use a spirit level to plumb the trusses and then lock them into place with screws and with rafter ties. Fit 3/4″ plywood sheets to the roof, following the pattern described in the diagram. Align the edges with attention and leave no gaps between the sheets. Drill pilot holes and insert 1 5/8″ screws into the framing, every 8″ along the rafters. Attach the 1×6 side trims to the carport. Align the edges with attention and then secure them into place with 2″ brad nails. Attach 1×6 slats to the gable ends of the carport. Cut the slats and then secure them to the supports with 2″ brad nails. Leave no gaps between the slats and then cut the slats at angle along the rafters. Use 2×6 lumber for the gable end trims. As you can see in the diagram, you need to make angle cuts to both ends of the trims. Fit the trims to the gable ends of the 3 car carport. Align the edges flush and then insert 2 1/2″ screws so you lock the trims into place tightly. Cover the roof of the carport with tar paper and lock them to the plywood roofing with staples. Afterwards, install the asphalt shingles according to the manufacturer’s instructions. The shingles should overhang the roof for about 1 1/2″, on all sides of the construction. This step is optional, so it is a matter of taste and needs. You could attach 1×6 slats to the side walls and lock them into place with 2″ brad nails. Fit the 1×6 slats to the back of the carport. There are many customization you can make to this triple carport so it suits your needs. For example, you could add slats or lattice to all the walls except for the front one. Last but not least, I recommend you to take care of the finishing touches. Fill the holes with wood filler and let it to dry out for several hours. Check out the rest of the outdoor projects, to see more ways to improve the look of your garden. In addition, don’t forget to take a look over PART 1 of the project, so you learn how to build the carport frame. 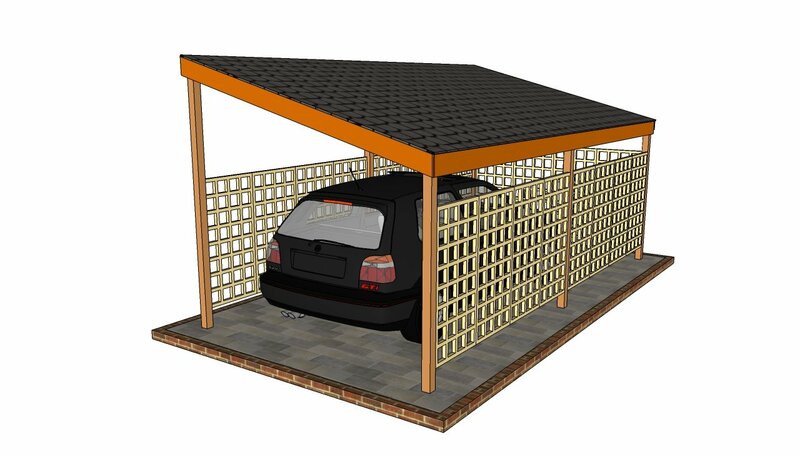 Thank you for reading our project about 3 car carport roof plans and we recommend you to check out the rest of the projects. Don’t forget to share our projects with your friends and LIKE us, by using the social media widgets. 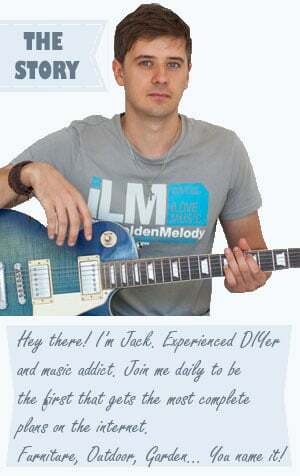 SUBSCRIBE if you want to be the first that gets our latest articles and to help us create more free plans.